Nobody’s perfect. 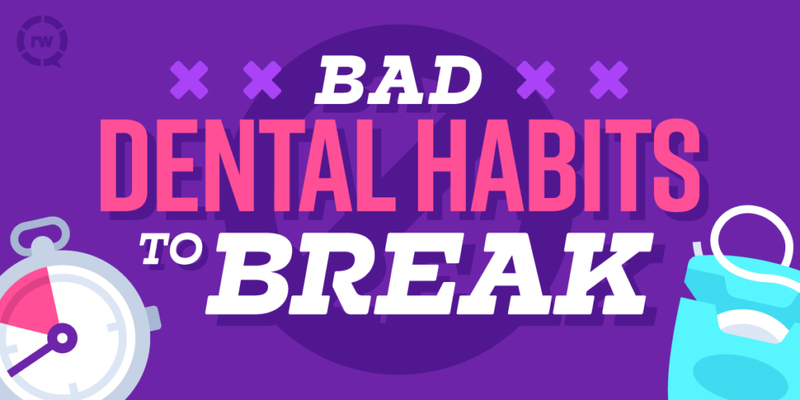 We all pick up bad habits along the way. Even our oral health isn’t immune. Try as you may, odds are you’ve picked up a habit or two in the name of convenience. That’s totally okay! We get it. And that’s why we’re here: to ensure your oral health is in fantastic shape. Here are a few less-than-stellar dental habits that we often see, with some tips on how to break them. You knew we had to start here! If you don’t visit the dentist every six months, or if it’s been a while since we’ve seen your smile, schedule an appointment today! You can call us at 303-460-9366 or email us at office@broomfielddentist.com to make an appointment. Staying on top of your health today can save yourself a lot of time and money down the road. Again, you probably figured this would be on here. And you know what, it’s for good reason. Flossing helps prevent decay and gum recession. It’s super important! So how can you remember to floss more? Put a post-it note on your mirror as a reminder. Invest in a flossing stick — some people find it much easier than the traditional method. Floss at the same time each day to build up a routine. You can also start small, setting a goal of once per week. After that settles in you may find yourself craving a good floss after brushing. One of the top causes of worn enamel is brushing too hard. If your arm is sore after brushing, or you look like a cartoon sawing at your teeth, pull back on the reins. Along with your enamel, over time this friction will also wear away your gum tissue. Keep your toothbrush at a 45-degree angle toward the base of the gums, and move the brush in a gentle, circular motion. When was the last time you changed your toothbrush? It’s not something you often think of, right? The problem with using an old toothbrush its frayed bristles can end up damaging your teeth rather than cleaning them properly. You should change your toothbrush every three to four months. A good mnemonic device is to change your toothbrush on the first day of every new season. That way you’ll never have an old brush! This one is self-explanatory, and it’s an easy fix. After you wet your tooth- brush, turn off the tap. That initial wetting is all the water you’ll need. Turning off the water is good for your bill and water conservation. The office of Mary E. Peebles-Turner, DDS, PC is located in Broomfield, Colorado and serves Broomfield and surrounding areas. What Causes Canker Sores? What Causes Tooth Discoloration?